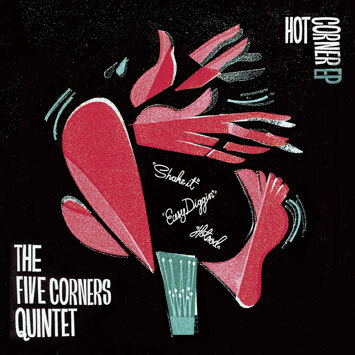 Released in May, the "Hot Corner" EP (RT023) marks the eagerly awaited return of The Five Corners Quintet. The single features three new tracks 'Hot Rod', 'Easy Diggin'' and 'Shake It'. A full-lenght album will follow later in 2008. Check out the Five Corners MySpace for a preview listen of the tracks. The Five Corners Quintet is back! Three years after their sensational debut, the modern classic "Chasin' the Jazz Gone By" which sold over 40 000 units worldwide, FCQ returns with a 10-inch EP titled "Hot Corners". Three tracks of intense dance floor jazz for the forward thinking clubber. Their second album will be released in late 2008. A: "Hot Rod" (T. Kallio): Rockabilly inspired intense dancefloor number that fuses modal jazz with driving upbeat shuffle. If Gene Vincent had collaborated with Wayne Shorter, maybe the result would have sounded something like this. AA: "Shake It" (T. Makynen): Intense uptempo number which keeps the musicians - and the dance floor - on its toes. If Cannonball Adderley Quintet had interpreted The Sonics, perhaps it had gone this way. AAA: "Easy Diggin'" (T. Kallio): Melodic and versatile instrumental track which makes you want to clap your hands and shout ‘Yeah!'. If Boogaloo Bacharach had recorded something for Stax Records had the result been this, we wonder.